H/CAMS is our comprehensive family of applications, databases, and services dedicated to crude assay management. Several major enhancements have been made to H/CAMS this last year. Beside improvements to the main user Interface, the Blend Optimizer user Interface has been completely rewritten making it easier to use and with more functionality. Swing cut modelling has been completely revamped and is now much easier to setup with Tray factors. A major addition to the system is a new Flash Assay update spreadsheet interface and automatic flash assay update. Output Interfaces have also been improved, particularly the data import speed. 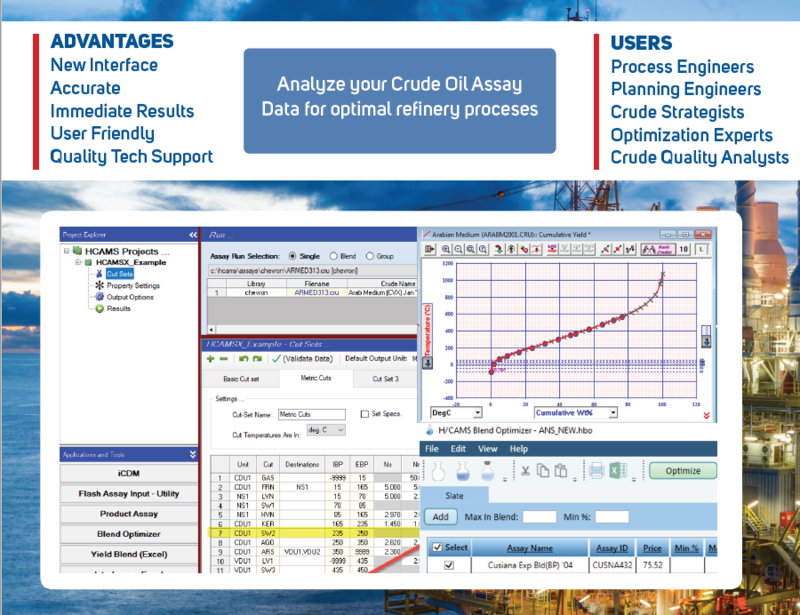 Use a new generation of Interface tools that Integrate directly with all LP and Process simulation applications. Optional spreadsheet and/or database output format.